Active Directory Help Desk Delegation and Management have gained a lot of prominence in the Microsoft Windows Active Directory Management process. As organizations grow, networks, additional resources, and administrative tasks also grow at a similar pace. It becomes difficult for the IT department to manage the entire Active directory in a timely, error-free and efficient manner, thus making 'Delegation of Active Directory tasks' crucial. With native Active Directory tools, delegation becomes yet another tedious and cumbersome task. Fortunately, ADManager Plus, a web-based Active Directory Management & Reporting software, provides the much-needed ability to delegate routine Active Directory, Exchange, Office 365 and G Suite management and support tasks throughout the enterprise with its powerful 'Active Directory Help Desk Delegation' feature. It allows the AD administrator to delegate tasks to non-administrative users like help desk technicians, with appropriate authentication and authorization controls that dramatically reduce the work load on the AD Administrator. In a real time environment an Active Directory administrator spends unproductive time attending tickets related to password reset, unlock users, create users in Office 365, assign Office 365 licenses, etc. Although they are simple, these activities consume a lot of time. 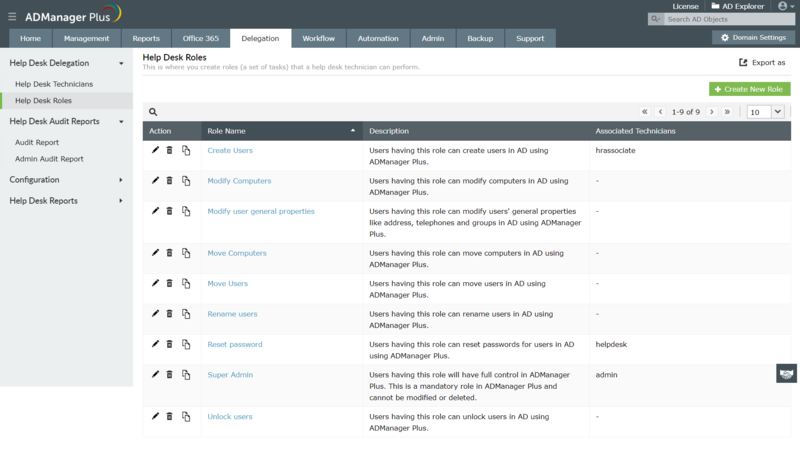 ADManager Plus' Help Desk Delegation is a completely secure feature helps non-administrative users to handle these simple AD tasks without involving the administrator in the process. To find out how the delegation feature of this tool can help you offloading the excess burden off your back, get the free download of the trial version which allows full access to all features for one month. OU Based Delegation: The OU based administration lets the administrator to delegate tasks with a scope limited to a specific Organizational Unit i.e. help desk users can perform the delegated activities (like reset password, manage remote user logon permissions, Terminal Services properties, etc.) that fall under the purview of the assigned OU in the Active Directory making this delegation completely secure. This ensures that the security issues are intact and the delegation runs smoothly. Group Based Delegation: Besides delegating help desk roles to individual AD users, you can delegate them to AD groups as well. Delegating a role to an AD group would result in all the group members having permissions to perform the tasks defined in that role. Office 365 delegation: You can delegate Office 365 management and reporting to help desk technicians with the option to assign only specific Office 365 domains and licenses. G Suite delegation: You can delegate G Suite management and reporting capabilities to help desk technicians. Click here for steps to delegate tasks to technicians using ADManager Plus. The Active Directory Help Desk delegation feature could be especially useful when our company is on a hiring phase which in turn has led to a sudden influx of new employees. So provisioning of new user accounts becomes a major priority and also a time consuming factor. Administrator can reduce the time lag and his intervention involved in this process by authorizing the HR personnel to create new user accounts in the Active Directory. The AD Help Desk Delegation module provides a login to HR, through which he can view and perform only the tasks that are delegated to him. More on ADManager Plus's benefits for HR. The most common and recurring issues that users face are account lockouts and password issues. Regular requests like reset password and unlock account requests consume most of administrator's productive time and mounts cost. To combat this, he can delegate these AD activities to help technicians by authorizing them to login to ADManager Plus and execute the delegated tasks. Administrators can delegate Active Directory, Office 365 and G Suite management and reporting capabilities to technicians or non-IT users from a single console securely. These technicians can perform delegated management and reporting actions for Active Directory, Office 365 and G Suite accounts from the same console. With defined administrative boundaries, technicians can perform specific actions such as create users, manage licenses in specific domains. User onboarding process does not end with creating user accounts in Active Directory. The employees have to be assigned mailboxes as well to begin their day-to-day tasks without any delay. You can delegate permissions to create mailbox, set delivery restrictions, Exchange policies, and more to technicians. To explore more on Active Directory Helpdesk Delegation using ADManager Plus, Download the Free Trial. The cross-domain management option allows AD administrators to allocate Multiple Domain Support for Help Desk Technician(s). This feature facilitates administrators to restrict help desk associates to manage specific AD domains across different forests, irrespective of the domain to which the help desk associate actually belongs. You could also refer our online Help on Active Directory Help Desk Delegation to know more about this feature. Audit Report: The audit report can be used to track what Active Directory objects were created, deleted, or modified, by which Help desk technician and when. Admin Audit Report: This report will list all the actions performed on the technicians by the administrator. Actions such as technicians and roles created, modified and deleted will be recorded. Technicians Report: This report will provide the logs of the technicians in ADManager Plus. It will give information such as delegated roles, OUs and domains in Active Directory, Office 365 and G Suite.